Self regulation skills help children to control emotions, thinking, behavior and motor actions in different situations. Throughout the day, children need the ability to tolerate sensations, situations and form appropriate responses. It requires that children control their impulses to stop doing something if needed and to participate in something even if the children does not want to do it. For example, children need self regulation skills to control an impulse to move all around the auditorium during an assembly and they need to sit and watch the assembly even if they are not highly interested in the presentation. Research indicates that self regulation in children is a predictor of academic abilities. Children with higher levels of self regulation have achieved higher scores in reading, vocabulary and math. In addition, some research has shown that the ability for young children to self regulate is associated with higher, future education levels. The ability to self regulate is an extremely important skill that needs to be taught to children. Red Light, Green Light – kids move on the green light and stop on the red light. Don’t get caught moving on the red light. Mother May I – one child is the leader. The rest of the children ask: “Mother May I take….” a certain amount of steps, hops, jumps or leaps to get to the leader. The leader approves or disapproves. Freeze Dance – turn on music. When music stops children have to freeze. Follow My Clap – The leader creates a clapping pattern. Children have to listen and repeat. Loud or Quiet – Children have to perform an action either loud or quiet. First pick an action i.e. stomping feet. The leader says Loud and the children stomp feet loudly. Simon Says – Children have to perform an action only when the leader says “Simon Say do…”. For example, if the leader says “Simon Says touch your toes” and all the children touch their toes. If the leader says “Touch your toes”, no one should touch their toes. Body Part Mix Up – The leader will call out body parts for the children to touch. For example, the leader calls out “knees” and the children touch their knees. Create one rule to start. Each time the leader says “head” touch your toes instead of your head. This requires the children to stop and think about their actions and to not just react. The leader calls out “knees, head, elbow”. The children should touch their knees, TOES and elbow. Continue practicing and adding other rules to change body parts. Follow the Leader – The leader performs different actions and the children have to follow the actions exactly. Ready, Set, Wiggle – The leader calls out Ready…Set…Wiggle and everyone wiggles their bodies. The leader calls out Ready…Set…Watermelon. No one should move. Leader calls out Ready…Set…Wigs. No one moves. Leader calls out Ready…Set…Wiggle. Everyone wiggles again. You can change this to whatever wording you want. The purpose is to have the children waiting to move until a certain word is said out loud. Color Moves – Explain to the children that they will walk around the room. They are to move based on the color paper you are holding up. Green paper means walk fast, yellow paper means regular pace and blue paper means slow motion walking. Whenever you hold up a red paper they stop. Try different locomotor skills – running in place, marching, jumping, etc. If you need more ideas to teach self regulation skills to children Self Regulation Skills Curriculum. 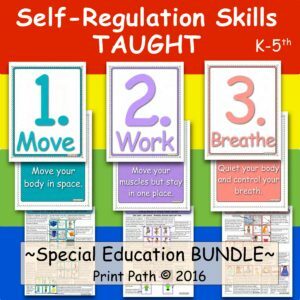 Self- Regulation Skills Taught: This curriculum provides an effective, time-efficient structured system to provide classroom breaks, improve self-awareness and self advocacy and teach specific self-regulation skills so that kids have tools to use in their classrooms. This system will get kids moving, give them the benefits of a brain power boost [from getting their heart rate up], give them heavy work and isometrics to help them calm down, and help them learn techniques to quiet and control their bodies in order to return to their academic work. FIND OUT MORE. 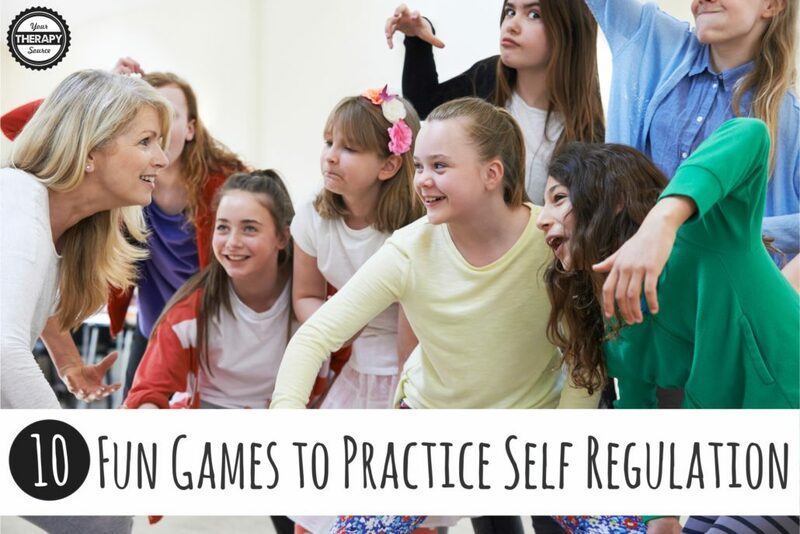 Read how to play 6 more Self Regulation Games for Children.